The history of Malayalam Language in the background of prehistory and external history within the framework of modern linguistics. The author has made use of the descriptive analysis of old texts and modern dialects of Malayalam prepared by scholars from various Universities, which made this study an authoritative one. The book is a short history of the painting tradition and sculpture of Kerala from mural to modern period. The approach is interdisciplinary and tries to give a brief account of the change in the concept, expression and sensibility in the Art Scenario of Kerala. Hortus Malabaricus published during the period 1678- 1693 from Amsterdam, is the first printed book on the plant wealth of Malabar and is the most important source of information on the plants of India and South East Asia. This twelve volume treatise was compiled by the then Dutch Governor of Malabar at Cochin, Hendrik Adriaan Van Rheede, and contains the indigenous pre-ayurvedic knowledge of the hereditary medical practitioners of Malabar. The book contains illustrations of 742 plants belonging to 691 modern species, their descriptions with pictorial representations, medicinal and other uses. The sketches drawn by efficient artists help us to easily identify the plants that have grown in our backyards. 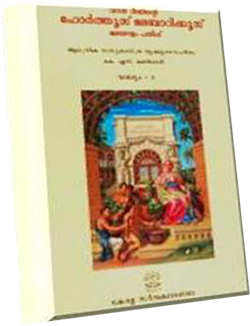 It is the Malayalam translation of the English version of Hortus Malabaricus published by the University of Kerala in the year 2003. An authoritative Malayalam literary history by Ulloor S. Parameswara Iyyer. The book is in five volumes and the latest is the IV edition. It gives a detailed description of the developmental history of Malayalam language and literature, and the literary history of Sanskrit as well. A critical commentary on the Abhijnanashakuntala of Kalidasa. The author cites various views of other commentators on the differentproblems which concern the drama, as well as the portions in the textitself and argues to establish his own particular points of view. Advaitasataka as the name indicates is a treatise on the main tenets of Advaita Vedanta in hundred stanzas. The work is based on more than a dozen manuscripts. To provide Malayalam with an adequate terminology to meet the demands of the progress in civilization and the discoveries in Science and Art in modern times. To publish popular works on Science and general culture. To translate the World Classics. To collect source materials to pave the way for a comprehensive and accurate history of Kerala and its culture. Thus, the Department of Publications was started with the object of enriching Malayalam language and literature. During its formative stage it brought out a series of glossaries, popular science books, translations from classics and original books written by scholars from outside. Six Glossaries were published on Mathematics, Chemistry, Physics, Botany, Zoology and Education. The other works included translations of Marcus Aurilius, Plutarch’s Lives, Montaigne’s Essays etc. An edition of Srimat Bhagavat Gita and a treatise on Sanskrit Grammar titled 'Saraswathi Kantabharanam' were also brought out. The department also undertook the publication of scholarly extension lectures delivered by eminent persons under the auspices of the University. During these remarkable years of publishing work, the most acclaimed work of the Department of Publications has been the publishing of 'Hortus Malabaricus' in 2003. 'Hortus Malabaricus', published from Amsterdam in 12 volumes during 1678-1693, compiled and printed by Hendrik Adriaan van Rheede tot Draakestein, the then Dutch Governor of Cochin, a princely state of India, is the oldest comprehensive printed book on the natural plant wealth of Asia and of the tropics. This book gives vivid details of the medicinal properties of plants, the respective diseases for which they were used for treatment and the modes of treatment as known to the ancient, renowned traditional physicians of Malabar(Kerala). This work also throws light over the cultural, social, political, historical and linguistic conditions of India as well as Kerala. In 2008, the Department of Publications released the Malayalam edition of the work.